De Beers Group has announced a US$3 million partnership with UN Women to improve the prospects of women and girls in its producer countries. The company will also seek to accelerate the advancement of women in its organisation and ensure its consumer brands are a positive force for supporting gender equality through its marketing campaigns. In recognition of De Beers Group’s commitment to women’s equality, CEO Bruce Cleaver has been named one of eight UN Women ‘HeForShe’ Thematic Champions, an appointment announced by Phumzile Mlambo-Ngcuka, UN Under-Secretary-General and Executive Director of UN Women. As part of the partnership, unveiled in New York on 20 September, De Beers Group plans to achieve parity in the appointment rate of women and men into senior leadership by 2020. To support this, a gender diversity group, reporting to top-level management, has been established, while unconscious bias training, a senior manager-led reciprocal mentoring programme and a review of policies and recruitment guidelines are also under way. The company will invest US$1million a year during the three-year deal to advance women micro-entrepreneurs and science, technology, engineering and mathematics (STEM) students in its producer countries – Botswana, Canada, Namibia and South Africa. 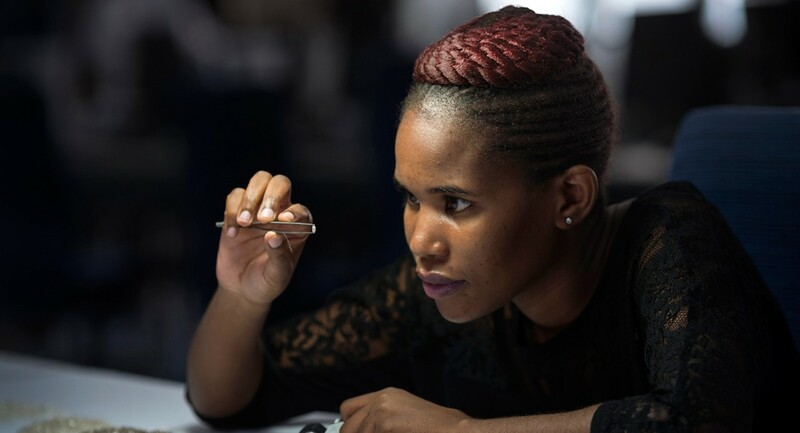 Micro-entrepreneurs will be the focus in southern Africa, while in Canada De Beers Group and UN Women will work with the University of Waterloo to mentor and provide scholarships for female STEM students from underprivileged communities. The programmes are in the advanced planning stage and are due to be launched in the coming months. De Beers Group’s two consumer brands, Forevermark and De Beers Diamond Jewellers, will work with UN Women to support their marketing teams in supporting gender diversity through advertising, and they will run creative campaigns that reflect the diverse roles that women occupy in society. Both brands have already begun commissioning new campaigns, which are due to run later this year and next year, inspired by equality and the evolving role of women. Also named as a new HeforShe champion was Lord Tony Hall, Director-General of the BBC and Christopher Crane, CEO and President of Exelon Corporation. They join Justin Trudeau, the inaugural Head of State Thematic Champion; Dr Jim Yong Kim, President of the World Bank Group; Emmanuel Faber, Global CEO of Danone; Giles York, Chief Constable of Sussex Police; and Nick Ephgrave, Chief Constable of Surrey Police. UN Women is dedicated to gender equality and the empowerment of women. It was established by the UN to accelerate progress on meeting their needs worldwide. De Beers is a member of the Anglo American plc group. Established in 1888, De Beers is the world’s leading diamond company with expertise in the exploration, mining and marketing of diamonds. Together with its joint venture partners, De Beers employs more than 20,000 people across the diamond pipeline and is the world’s largest diamond producer by value, with mining operations in Botswana, Canada, Namibia and South Africa. As part of the company’s operating philosophy, the people of De Beers are committed to ‘Building Forever’ by making a lasting contribution to the communities in which they live and work, and transforming natural resources into shared national wealth. For further information about De Beers, visit www.debeersgroup.com.